An ecosystem contains living and non living things. The ecosystem has many examples of the interaction between the living and non living. The living things in an ecosystem are called biotic factors. Living things include plants, animals, bacteria, fungi and more. The non living parts of an ecosystem are called abiotic factors. In an ecosystem some abiotic factors are sunlight, temperature atmospheric gases water and soil. One example of the interaction between abiotic and biotic factors is with plants. The plants use sunlight, water, and CO2 to make food. 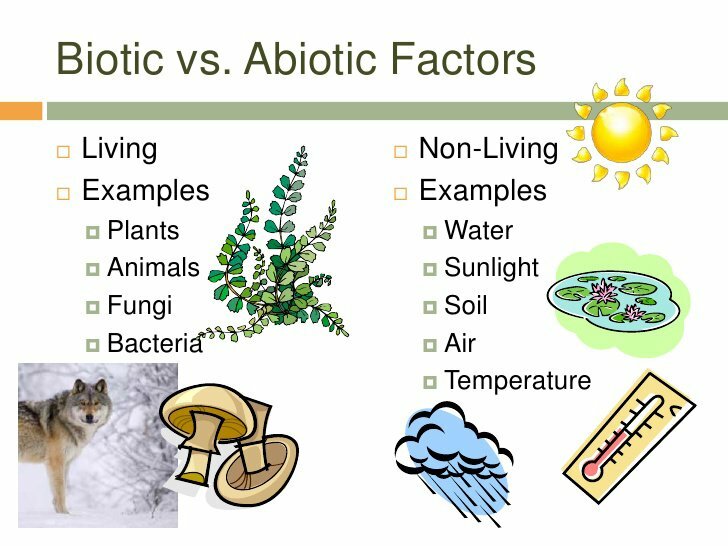 Without these abiotic factors plants would not be able to grow. Another example is the interaction between turtles and soil. Some turtles are known to bury themselves in soil. When the temperature becomes too hot turtles seek protection in the cool underground. Elephants and water interact as well. In order to stay hydrated elephants drink water. In fact all biotic factors need water to survive. Fish and temperature also show the interaction between living and nonliving. A fish's' body temperature matches it surroundings. warm tropical waters keep a tropical fish's body operating at an optional temperature. Another example is a fox and snow. When the temperature drops and snow starts to fall some foxes grow a white fur coat. The thick coat insulates and keeps the fox warm. Also the color matches it surroundings, an adaptation known as camouflage. Lastly Bacteria and soil interact. Bacteria are decomposers. Decomposers get energy by recycling dead organisms back into the ground. Nutrients enter the soil helping making the ground fertile.